This article shows you how to check your server resource usage. You can view your DV's status directly from the AccountCenter. This will give you a detailed history of your server's resource usage. You can also use the 'top' command via SSH to view the usage level of most resources directly from the server. Sign in to the AccountCenter. Enter your DV Control Panel by clicking the Admin button next to your server on the Overview tab of the Account Center. 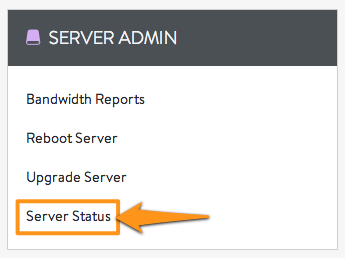 Select Server Status under the Server Admin heading. This page contains graphs of all of the resource usage on your DV. Use the tabs at the top to select the time shown. You can click the items shown on the right side to toggle visibility. CPU: Your current CPU usage. RAM is calculated using a maximum value of 100%. If your RAM use is constantly high, consider optimizing your applications and configuration to reduce memory usage or upgrade your server to the next level. You may also obtain a raw version of this info via SSH by using the ‘free’ command. Use ‘free –m’ for a printout in megabytes as opposed to bytes. Load 5 Min: Average server load for the past 5 minutes. Load 15 Min: Average server load for the past 15 minutes. Processes: The number of processes currently running on your server. KBytes in/Sec: Number of kilobytes being uploaded per second. KBytes Out/Sec: Number of kilobytes being served or downloaded per second. Packets In/Sec: Number of packets being uploaded per second. Packets Out/Sec: Number of packets being served or downloaded per second.